Simon Spurr has done it again. The former Ralph Lauren Purple Label and Yves Saint Laurent menswear designer flexes timeless aesthetic with his Spring 2012 collection. If there were ever doubts about the breadth and depth of Mr. Spurr’s sartorial scholarship, he has certainly demonstrated with resounding achievement. The Simon Spurr brand essence is clean, classic garments juxtaposed with modern patterns and modern silhouettes. Black, white, and shades of navy, grey, and olive are represented for Spring 2012. The collection offers just what most (I’ve) have come to expect from Simon Spurr; flawlessly tailored three-piece suits. 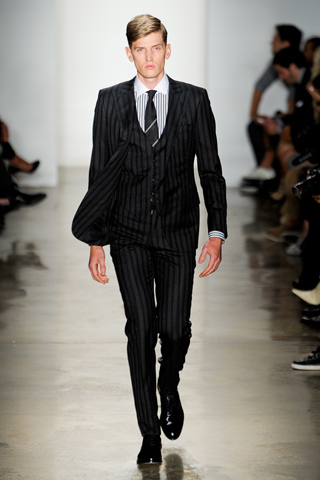 The grey on grey pinstripe three-piece peak lapel was the first of three on the runway. 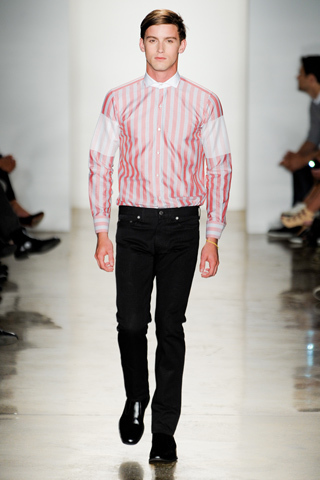 There were splashes of typical spring colors in a contrast lavender, pink pinstripe, and green gingham dress shirts. 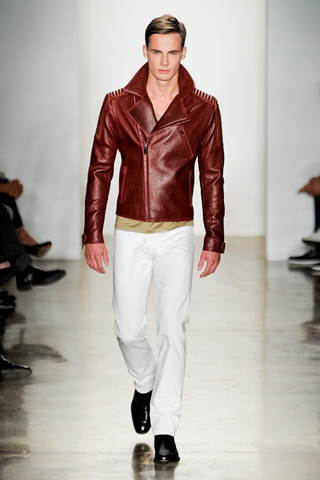 Spurr saves the best for last and unveils an asymmetrical burgundy motorcycle jacket. This hand-finished leather jacket is a vision of rugged sophistication. Placing the look at the end of the show is absolutely perfect. The jacket literally took my breath away. Jacquard garments, bold patterns, slim black denim, leather sleeves and lapels, and mesh tanks leave Spurr admirer’s with new interpretations and quintessential cool. 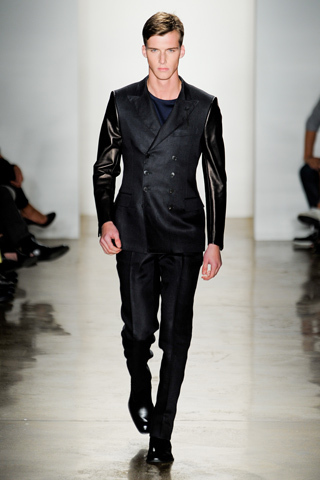 This entry was posted in Designers and tagged elegance, leather jacket, menswear, Simon Spurr, Spring 2012, three-piece suit by bravadopersonified. Bookmark the permalink. Wow, those leather sleeves look fantastic. You said it – this is daring elegance to be sure. Yeh, the jacket looks so much better in front of you. All his garments are stellar.